In preparing for my presentation on What's New in DVD 3.0 Webinar (tomorrow! 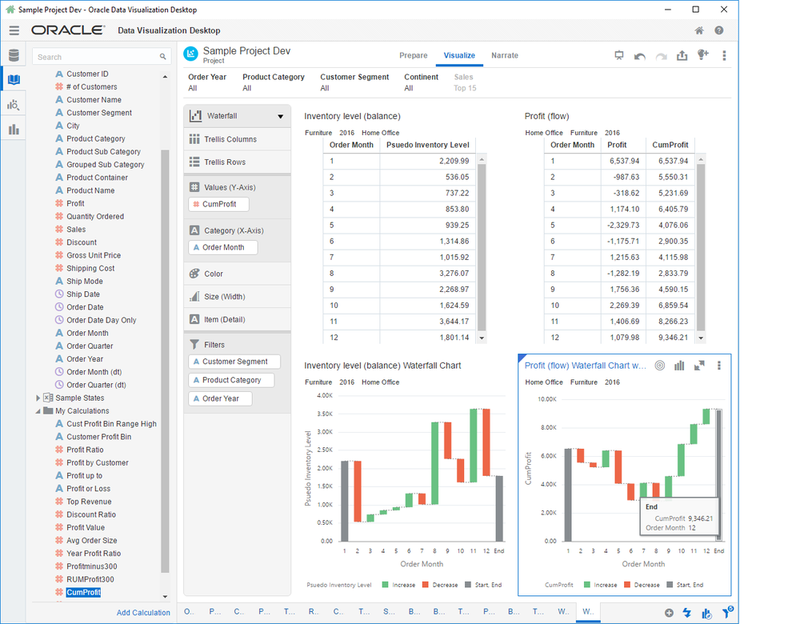 ), I found that the new waterfall visualization was geared towards balance measures (like a checking account balance) instead of a flow or performance measure such as profit. One of the key differences is that for a flow measurement the value can easily be negative. In any business, you may lose money in a given period, but you hope to make up for it in prior or future periods. In addition, flow analysis can be great for showing sources of gains and losses. A waterfall graph typically shows this very nicely. But the waterfall graph in DVD 3.0 is designed for balance information. In order to use the waterfall graph, you can convert from the flow measure (such as profit) to a balance by using the RSUM function in OBIEE. Put simply, RSUM(profit) gives you the running sum of profit for the year, adding up each month. It accumulates the profit which is exactly what you need in order to use the waterfall graph. So, on the left you can see a waterfall graph of an inventory balance. No special formulas needed. On the right, you can see a waterfall graph of profit. In this case, we actually use the cumulative profit measure so we can properly visualize the periods where we lost money. We can easily see that we ended the year with a total of $9346. Tim Vlamis was asked by Bob Rhubart of Oracle Technology Network to share a 2 Minute Tech Tip during his recent trip to the Great Lakes Oracle Conference in Cleveland, OH. Tim's tip focuses on the importance of applying your own sort order when visualizing data. See Tim's speedy (33 seconds!) Tech Tip below or read more from Bob Rhubart! Join Dan Vlamis, Oracle ACE Director, as he demonstrates Oracle Business Intelligence using the latest release V607 from the Oracle BI SampleApp team. SampleApp is known in the Oracle BI consulting community as THE go to platform for showcasing what Oracle BI is capable of. Release V607 of SampleApp runs on version 12.2.1.1 (first 12c patch release) of Oracle Business Intelligence Enterprise Edition. Expect a fast-paced presentation with a live demo using a brand new SampleApp image. The webcast will also include other demonstration and learning platforms Oracle is rolling out to users. This platform is geared towards Oracle BI (and Data Visualization Desktop) users, allowing them to learn new techniques, and even to download additional visualizations into the Oracle BI platform. Tim and I were attending the Kscope16 conference in Chicago and were thrilled to see the Jessica had brought her well-worn book, Data Visualization for Oracle Business Intelligence to the conference. As you can see from the picture, the book is well-worn, with coffee stains and color tabs. The memorable part of the conversation is when Jessica said she was reading about data visualization at her kid's baseball games! It was great to meet someone else passionate about their BI dashboards. Thanks for saying hello, Jessica!